Charlie Farquharson-Roberts is a Latin teacher and private tutor, but a medievalist at heart. She once wrote an MPhil thesis on the Venerable Bede’s Latin hymns. With small children these days, she finds herself chair of the PTA. Find her on twitter @camlatintutor. I have spent this year gainfully unemployed from Latin teaching in schools and instead volunteering increasing amounts of my time at my kids’ state primary school in central Cambridge, St Luke’s. St Luke’s is doubly fortunate in having wonderfully inspiring teachers, and also extensive grounds in the heart of the city. When another parent volunteered to run a gardening club, she was determined to link it to the school curriculum, and hence Year 5 in their autumn Anglo-Saxons term have planted ancient grains in the manner of Anglo-Saxon farmers, visited West Stow Anglo-Saxon Village, built replica houses and also read Beowulf (tr. Michael Morpurgo). How could I not offer them a session on Anglo-Saxon manuscripts? 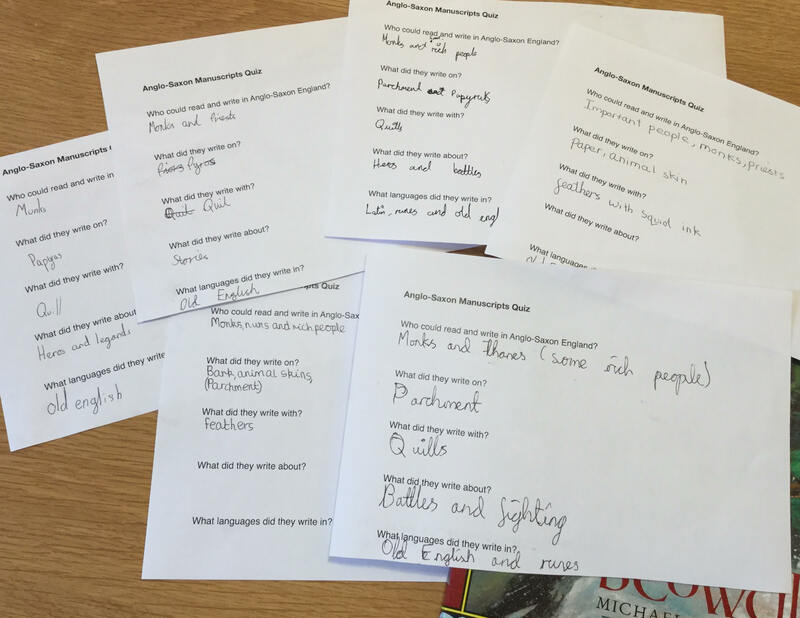 The Learning Objective was for the pupils to gain an understanding of Anglo-Saxon material culture with specific reference to book production, with the end goal being for students to produce their own imagined version of folios of the Beowulf manuscript. If time allows, discussion of how quires were bound together etc. Time did not allow! Extension activities – a MS word horde word search grid and pages to colour in based on Kells illustrations. We did not need these either. I totally overthought it. I was nervous that two hours would be too long, that the children would not share my enthusiasm and find it dull, so I planned and planned. However, enthusiasm is famously contagious and I shouldn’t have worried. Reinforced by the marvellous Dr Emily Dourish from the Rare Books Room at Cambridge University Library, along with a range of items from her UL colleague Shaun Thompson’s personal scribal kit, and utterly fired up from a visit to the British Library Anglo-Saxon Kingdoms Exhibition, I had planned so many fun things to do and two hours was not nearly enough time to do them all. A whole day might have sufficed, but a week would have been better. Did people ever write in squid ink? Were manuscripts ever written purely in runes? Was papyrus ever used in AS England? As we went through their answers, we linked into the things that Emily had brought with her. Various pieces of parchment were utterly fascinating to pupils and staff alike. The frame for stretching skins raised questions about holes in pages and repair of pages. When we got to ink production and pigments, much excitement was raised at the piece of real life lapis lazuli, more normally known to the pupils as something mined online in Minecraft. Far too soon into our discussion, the teacher pointed out that we were half way through the session and hadn’t started making anything yet. Time certainly flies when you’re having fun and I was surprised at quite how engaged the pupils were by the discussion points. Obviously, looking at and handling the various parchment items took up a good amount of time too. As the class had been reading Beowulf, my plan was for them to make their own Beowulf manuscripts, introducing folding of quires, pricking and ruling, and showing various images of different page layouts so they could design their own. I had brought along laminated sheets showing various MS pages for this purpose, and so as not to have to rely on online images. I was intending to talk about script systems too, but time did not allow. There was much I was intending to mention! I sufficed with giving them sheets showing half uncial and insular minuscule which some pupils were keen to try and emulate. I was delighted when several pupils independently pointed out the word ‘Beoƿulf’ on the Beowulf manuscript image. I had spent some time procuring and cutting feathers to make into quill pens and these were very popular. I should have got enough for everyone in the class to use one simultaneously. Instead groups swapped between experimenting with the quills on scrap paper, and pricking and ruling their quires, with extra colouring pens and pencils supplied by their teacher, Ms Din. Ms Din had put a page of Beowulf up onto their visualiser for them to copy a passage, but it was so exciting to see our young scribes making decisions about how to lay out their pages. Some embraced huge capitals, others went for larger introductory text, others for an imaginative whole page depiction of Beowulf, sword in hand, bearing down on Grendel. One of the truths about Anglo-Saxon manuscripts is that no two are identical. I think it is safe to assume that this is not an accident of survival. It was wonderful to see pupils initially upset at blotting their pages, but then turning their blots into creatures or swirly decorations and being proud of their creations. There was just enough time to return the classroom to normal, wipe up inkblots and have a very quick plenary on manuscript production before the end of the school day. Things we did not get to cover included a demonstration of mixing up pigment with egg yolk, burning some parchment and chatting about the Cotton fire, exploring and creating our own interlaced creatures (though some did this anyway on their own manuscripts), using kitchen foil to make gold leaf, watch any of the excellent Polonsky/ BL videos , the list goes on! What the children did get was a very good idea of what manufacture of manuscripts would have involved, and the huge variations in books that were produced in the Anglo-Saxon period. I would also have liked to have spent a little more time talking about folding and stitching quires – this got slightly lost to one of the groups as they switched over. But as I say, there was much more I would have liked to have covered, and there’s only so much of a year of university palaeography, codicology and script systems lectures and classes, plus amazing titbits from Twitter, that one can squeeze into a two hour session! I would improve this session in future by having more images to be able to pass around and by having enough quill pens and inks available, along with brushes, for each child to use at once. We made do with felt tip pens that the teacher had in class. The skins and parchment were fascinating to the children and that could have been extended into a longer handling and discussion session, especially since these children knew a thing or two about farming and villages already. We were so lucky to have these things brought along from the UL, and indeed each child was given a small square of parchment to take home with them to do their own experiments on as they wished, for which I personally am very grateful to Shaun and Emily at the UL. The children also got to keep the manuscripts they had produced. I received some lovely comments after the session – a few pupils found me in the playground to ask questions and chat about manuscripts, and a mum even texted me that evening to say her son had not stopped talking about it. The teacher herself said that they could have spent a whole year on Anglo-Saxons but they had to move on, sadly. All in all, I think it was a good session and valuable to the children. I would love to recreate it in the future, hopefully with Emily and her UL friends’ assistance (I think we made a great tag team! ), and ideally for other schools as well. I must extend many thanks to Emily Dourish and Shaun Thompson; to Ms Din for having us into her wonderful Year 5 classroom and to St Luke’s for being open to visiting enthusiasts coming in to share manuscript love; to Teaching the Codex (@teachingcodex) for retweeting my MS queries and asking me to blog for them, and also for hosting the colloquium in 2017 which encouraged people to teach more codex out in the community. The videos on the British Library website are an excellent teaching resource and can be found here. 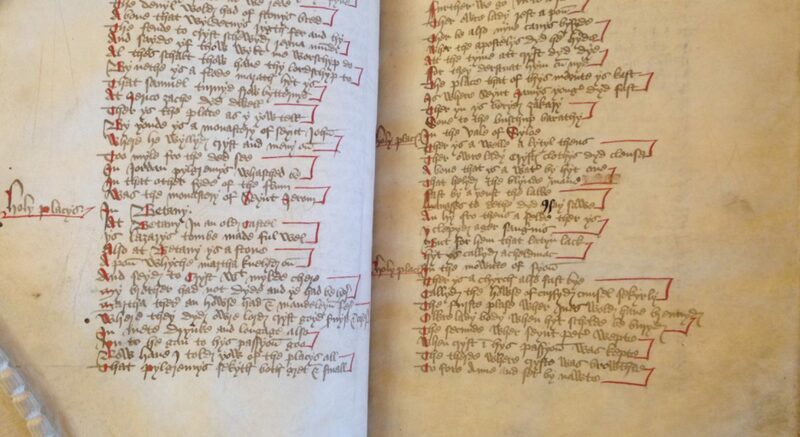 I am also grateful to all the wonderful teachers who taught the palaeography, codicology and script systems papers when I did my MPhil in the Department of Anglo-Saxon, Norse, and Celtic at the University of Cambridge, without whom I would not have developed this wild enthusiasm for manuscripts (@Department_ASNC). The British Library exhibition, Anglo-Saxon Kingdoms: Art, Word, War is open until 19th February 2019. Here’s a little of what I have been up to lately – still teaching Latin, but spending more time volunteering in my children’s state primary school, and loving it all!